Authority in Communication, Authoritative or Authoritarian? As leaders, fulfilling Jesus’ disciplemaking mission, we can sometimes be unsure of ourselves. — What if they won’t listen? What if they won’t do what I say? As a result we might go the route of saying what we think they want to hear, compromising and placating. Such communication lacks integrity and depth but we label it adapting to where people are with the hope of one day getting beyond. Too often, however, we never get beyond and people sense a lack of authority in the church. Or, we might overcompensate for our insecurities by setting ourselves up as the authority. People need to know a leader is in control, we reason, and then they will follow. We might begin with an authoritative flair to our communication but before long, we begin to act like an authoritarian. An hierarchical flow of communication ensues wherein its mostly about us telling people what to think and do with us welcoming little or no input from them. When our communication is governed by the Great Commission we get beyond these issues because we know the Source of Authority, and it isn’t us! The Church does have authority, found in the Person who is its Head, Jesus Christ. Jesus, who is the Way, the Truth, and the Life (Jn. 14:6), clearly stated, “No one comes to the Father except through me.” Who are we, as church leaders, to manipulate or coerce people, as though we are the authority? The Great Commission begins with verse 18 — “Then Jesus came to them and said, ‘All authority in heaven and on earth has been given to me. 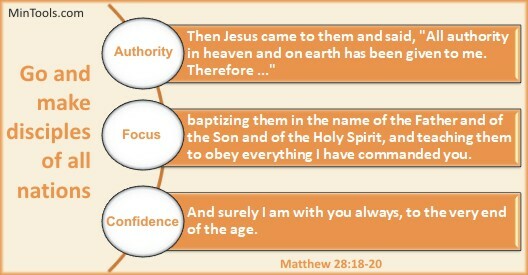 '” and continues in verse 19, based on that foundation, “Therefore go and make disciples …” (Matt. 28:18-20). The authority upon which leaders fulfill His mission isn’t their own but rather the Lord’s. Any authority in communication with others comes from Him, not because “we” are the leader. We communicate with others after we have first communicated with Him. We communicate based on His Word, not our opinions. We communicate with gentleness and respect (1 Pet. 3:15), not with a controlling aura that puts us on a pedestal while diminishing the value of others. We communicate from a place of humility, not superiority, acknowledging the One who is the Source of All Authority. Our communication might be seen as authoritative, when rooted in Truth, but that differs from being an authoritarian, a position Jesus exhorts us to avoid (Mk. 10:42-45). This entry was posted in Communication .